Getting Rid of Trash to Find My Treasures! 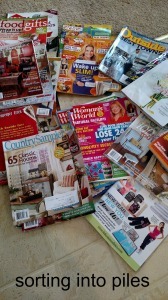 I’m still running a couple days behind on the 31 Days 2 Get Organized with Peter Walsh. 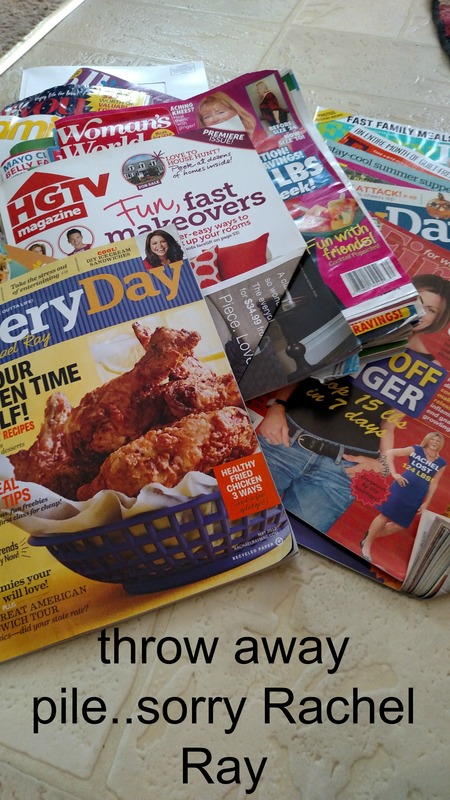 I did tackle the magazines we were supposed to do on Day 10 – I’m only two days behind…give a girl a break! 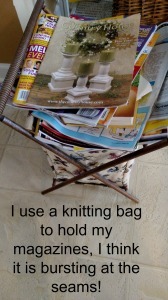 This is what my magazine holder looked like in my Powder Room downstairs! 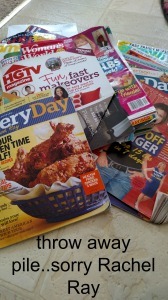 I threw away a lot and sent all the Every Day with Rachel Ray home with my future Daughter in Law for her mom to look at…I don’t think I even read that magazine and I don’t even know how I started getting it! 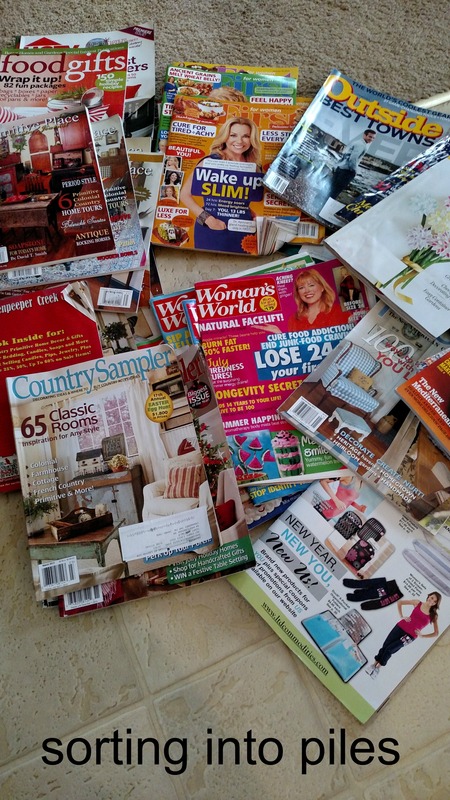 But, as Peter Walsh said, with Pinterest do you really need to keep all those magazines and the answer is NO, Peter, I do not!! 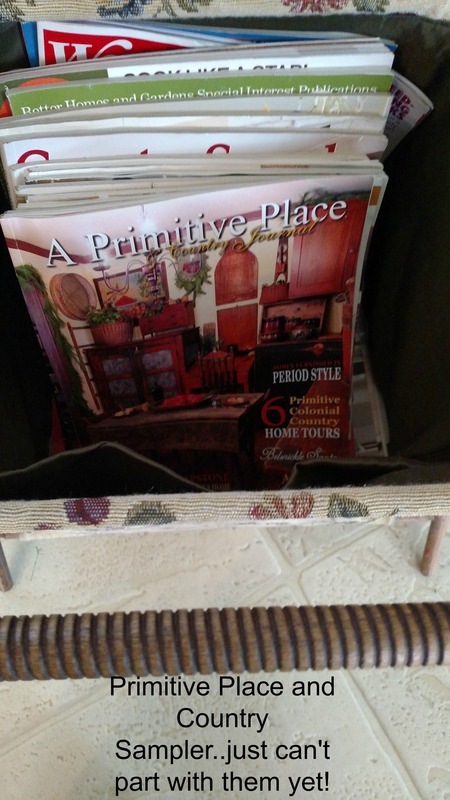 I only kept my Primitive Place and Country Sampler Magazines! I also got everything cleaned in there even the walls and baseboards. I also did some re-decorating with some new (old) primitive stuff! These are all items I got a t the Goodwill. 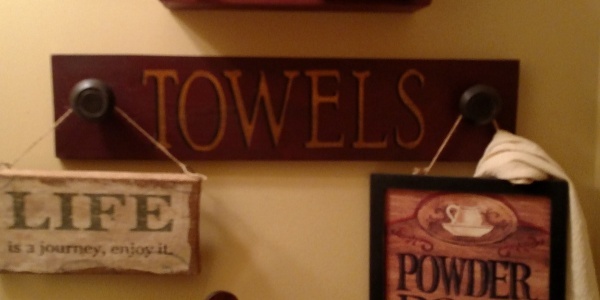 The Towels Plaque has two real door knobs, I paid $2.99 for it. I might have to try making one of those, it just looks like a real roll of TP that was dipped into wax, a homespun ribbon and rusty heart attached. Someone made the holder, the little heart on the top comes off to remove the TP! 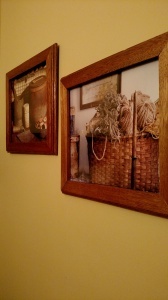 The Life is Journey is printed on burlap and the Powder Room picture were both $1.99. 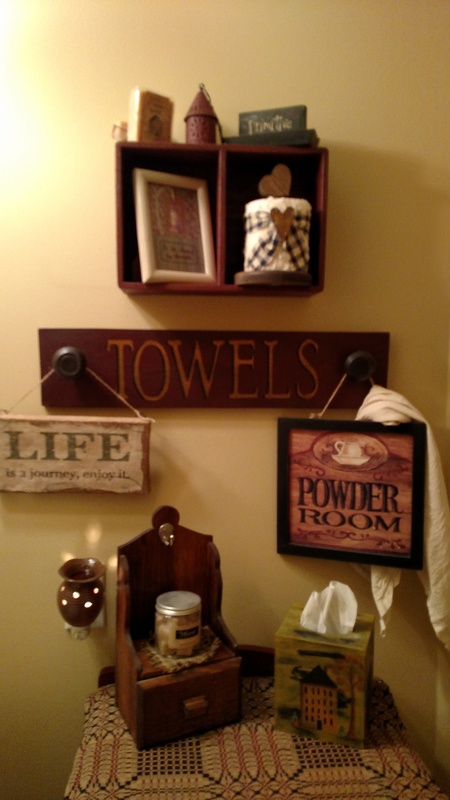 The shelf with little drawer was $1.99 and the hand-painted tissue holder with saltbox houses on all 4 sides was 99 cents! This is a wood cabinet I paid $15 for at yard sale 2 years ago. 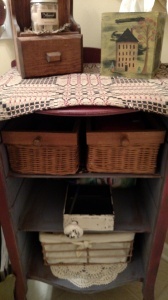 It has 3 shelves, but no drawers or doors, so I put baskets in there, they were all 99 cents or 1.99. Except, for the middle one which is a metal drawer with door knob. It was $6 .00 originally $12, but on sale for 50% off. On the back of the toilet is a 2″ thick oak shelf that I bought for $2.99. I was going to mount it on the wall, even bought wood brackets, but it fit nicely on top of the tank and adds a little prim to a modern toilet. 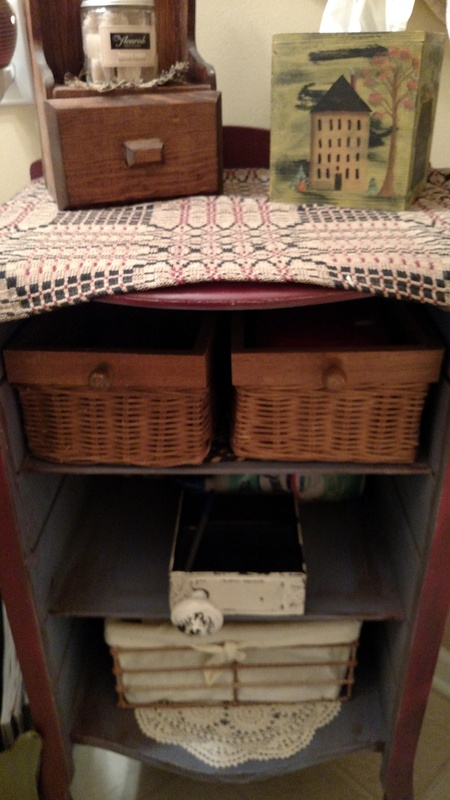 The two boxes are 2 old sewing machine boxes I bought for $2.50 each…that was a great find at a yard sale. The cheapest I’ve seen them are about $15. One day when I have my own home, I will probably mount these on the wall! 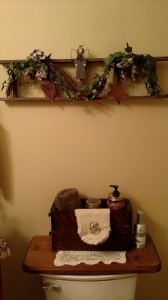 The tobacco wood ladder I just bought last week for 50 cents (it was 50% off day at Goodwill) It came decorated like this, eventually, I might change it out and remove the fake ivy, but I just didn’t have time today! These two pictures came from my 2014 Primitive Place calendar! The frames were made for me by a friend out of a pallet that came from Brazil. They were made specifically to fit a 12″ x 12″ calendar! The white baseboards need painted in here this year and I am also replacing the toilet paper holder and towel holder so I need to paint the wall and fill in the screw holes where they were attached to the wall. Don’t ask me how cleaning out a magazine rack led to all this, but I am enjoying these organizational challenges by Peter Walsh. You can follow me on Facebook and catch all his videos because I post them daily! I hope to be caught up soon with the challenge…one day at a time! Thanks for visiting, please consider following me on Facebook and Pinterest!